A few weeks ago, I touched on utilizing social media and review sites to the best of your ability. I want to take a little longer to specifically talk about review sites like Yelp, and review features as seen on Facebook, MapQuest, Google+, and a few other sites. For most of us, social media is a normal part of our every day life. Facebook is only a click away, and sites like Yelp are outlets for the gracious customer, or the fuming critic. Perhaps you already have experience with any of these features regarding your own business, or maybe you have left reviews for other businesses? Regardless, knowing how to interact and react with negative customers can help you in achieving more loyal customers, all the while weeding out some of the customers that you would rather NOT have visit your shop. If you have not yet taken the opportunity, I suggest claiming or creating pages on Facebook, Yelp, Google+, Angie’s List, MapQuest, Four Square, etc…You do not have to actively maintain each site, listing, or profile, but ensuring you have control and/or awareness concerning each media outlet will save you a headache later on! A great way to stay informed with any of these sites is to ensure that the “email notifications” option is turned on under each one of the accounts, that way when an individual leaves a review or comment, you will be instantly notified on your everyday email rather than having to log into each individual account or profile. 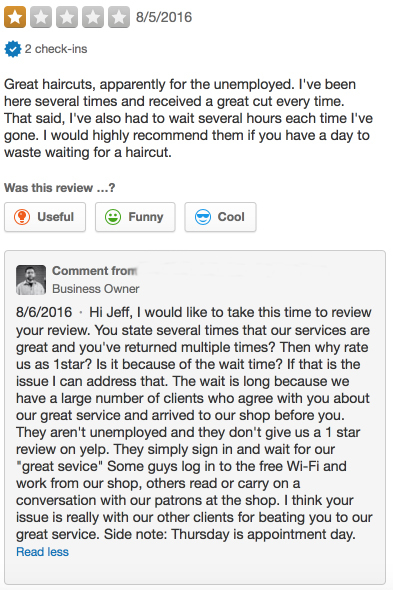 The review is generally positive, but the customer has offered you feedback about your wait times. Replying to a review like this has makes the customer feel good—you care enough about them as a customer to reply to their comment! 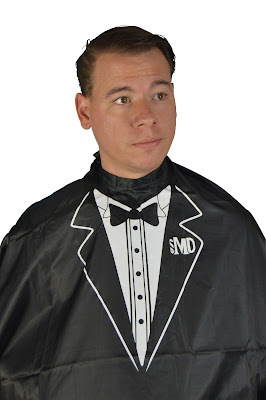 Yeah, you are already aware that your wait times are long, but this offers you the opportunity to grow, whether it be faster cut times (I know some of you barbers like to chat with the trimmer turned off! ), or utilizing booking applications or appointment books, which is of course a completely different conversation I’ll be touching on in a future article. I digress—in this situation, you don’t even need to go into extreme detail. Something like, “Thanks [customer], I appreciate you and your business!” will be just fine. 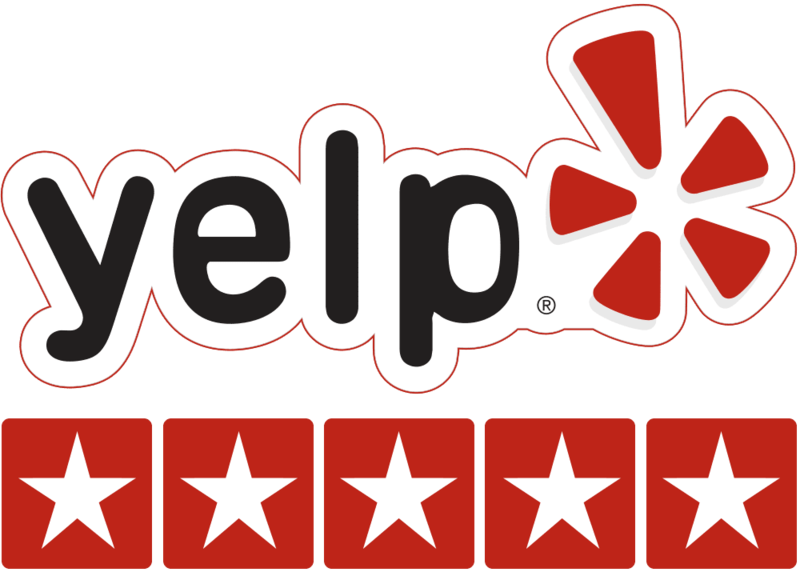 It shows the customer that you appreciate them, and it shows the potential customer scouting your Yelp page that you value your clients. Too easy, right? The next type of comment you will see on these sites is what I call the “ghost” review. There’s a rating, but there’s no feedback! For sites where you can select a rating, a customer will give you anywhere between 1-5 stars and not ask why. Here’s the thing that many business owners overlook—you can ask them to elaborate! If you see a customer that leaves a 5-star rating, but no feedback, you can ask them what they liked most about their experience. Even if they don’t reply, it shows others that you are willing to go out of your way to receive feedback on your shop to improve your service and performance. Let’s look at the other end of the spectrum: a customer leaves a 1-star review with no feedback. Fight through the frustration and reply back with something to the effect of, “Sorry you had a bad experience with us! We really want to show our customers how much we appreciate and value them, so can you describe what it was that made you feel unappreciated so we can prevent that issue from happening again?” This customer might not respond, and they probably won’t come back (if they were ever actually in your shop to begin with—sometimes reviewers will hear something about your shop and attempt to discredit your name, hence the “ghost” review), but that’s not the point. The point is that there are people who are scouting out your shop before they come in, and will be looking at how you interact with customers. Attempting to seek reconciliation with a customer who leaves a negative rating, with no feedback, shows that you genuinely care about you customers. The customer was irritated about a long wait time, even to the point of calling other customers “unemployed.” Rather than get infuriated, the owner of the shop utilized this as an opportunity to show others the quality of service at his shop. Notice how he defends the other customer’s dignity in wake of the bad reviewer’s allegations—the long wait time is due to the quality of service which all of the customers agree upon, and which they are happy to wait. But that’s not saying that they must wait in boredom, or in wastefulness, as the shop provides Wi-Fi and a comfortable atmosphere so patrons can either carry a conversation with one another, or work while they wait. While I would not suggest including a snarky “come back,” you can see how someone who has never been to this shop before would look at this review and say, “Wow. Even though they have long wait times, I can use the Wi-Fi and talk with other people. Oh, and appointments are on Thursdays? 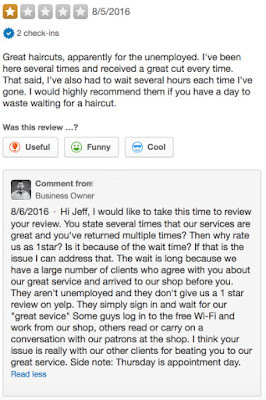 Maybe I’ll just make an appointment!” Even though a negative review was posted, this shop owner utilized it to reflect the benefits of his shop while defending his clientele, something which will always make your customers loyal to you and your shop. Overall, if you want to utilize review sites to your advantage, make sure you are asking your customers to leave a review for you. It’s pretty simple, really. If a customer doesn’t know that they should leave a review for you, they probably won’t, but if you ask them to leave a review for your shop, they will more than likely take the time to give you feedback. It’s inevitable that you will receive poor feedback in the form of a “ghost” review or a blatantly negative review, so don’t spend much time reflecting on the rating, but give extra effort in your reply. The rating is just a number, but the reply shows the true character of you and your shop, which people are more receptive to. Treat customers with dignity and respect, show that you appreciate feedback and aim to grow, and watch as your Yelp rating soars through the roof. If you have a few minutes, check out our site www.mdbarber.com where we sell all the latest elite barber gear and tools! We also have an app available in the app store called "MD Barber Supply".